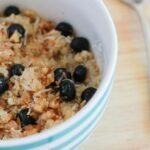 In keeping with the quinoa recipe theme this week, this time I bring you my recipe for Breakfast Quinoa with Blueberries, Coconut and Walnuts. I am such a big fan of quinoa as it is a great substitute for rice and oats and is great for anyone who follows a Clean Eating or Paleo Lifestyle as well as for people who are allergic to or intolerant to Gluten. Last night we had Quinoa Fritters for dinner and also this week we have had Chicken & Vegetable Soup with Quinoa and Lemon and Quinoa Bolognaise. Bring milk, quinoa and salt to a boil in a medium saucepan. Turn heat to low and simmer, covered for 15 minutes, or until the water is fully absorbed. While quinoa is cooking, toast the coconut and walnuts in a dry fry pan for a few minutes until browned. Remove quinoa from heat and cover with a tea towel or napkin and rest for 5 minutes. Fluff with a fork and spoon into bowels. To serve add the coconut, walnuts, blueberries and drizzle with honey.